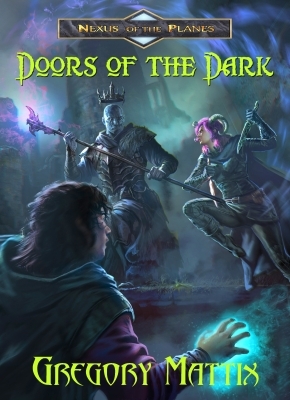 Doors of the Dark, Book 2 of Nexus of the Planes is now available at your favorite retailer! The great Machine of Nexus has fallen silent, the foundry destroyed. The city is isolated—cut off from all other planes—with neither escape nor any way to gain entry into Nexus. Food, water, and even air are becoming scarce commodities. Chaos and violence fill the streets. Nera is now a wanted fugitive who has lost much in the events leading up to the chaos. She must find a way to escape Nexus and find Malek, if he yet lives. Her search will take her to the sinister Gray Lands, a world dead of all magic and life and sealed off from the rest of the planes, centuries before. Friends are in short supply as she has already been betrayed once before and no longer knows who can be trusted. To make matters worse, a priestess and paladin of Sol approach Nera, trying to convince her she may hold the key to Nexus’s salvation.